For most of the players, the FIFA 20 Beta is the first chance to play the new EA’s title. We will explain here how it works and how you can get access to the FIFA 20 Closed Beta. SUMMARY | INTRODUCTION | RELEASE DATES | PLATFORMS | GAME MODES | HOW TO GET INVITED | HOW TO PLAY? What you really need to know about the FIFA 20 Beta? EA will email selected players with their Beta codes. They will only have enough codes for the players that they send emails to. If you don’t get an email with a code, EA Advisors won’t be able to give you one. Make sure you’ve opted in to get EA emails. Go to the EA Sports FIFA Contact Preferences page and check the first box. If you’ve changed your email address or no longer have access to the one you used to create your account, swap emails from one account to another. You can also add a secondary email address to your account. A secondary email helps you reset your password if you’re locked out of your EA Account and primary email address. 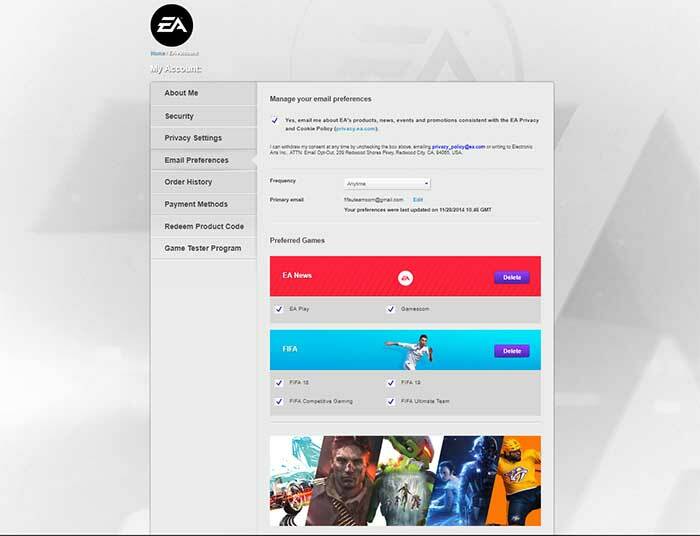 You can find the Secondary Email section under the EA Account Security tab. Can I get a few more FIFA 20 Beta details? Selected FIFA players in the US and the UK who opted in to get EA emails will get an email at the email address that’s linked to their EA account. Because of limited space in the Closed Beta, not everyone will get an email with a code. The email will include a FIFA 20 Closed Beta access code for PlayStation 4 or Xbox One. You’ll need to have an Internet connection, an EA Account, and have accepted the User Agreement and the FIFA 20 Beta Agreement. Live streaming and image capturing of Closed Beta gameplay or forums are against their rules as is discussing the content of the beta on the forum. What is the FIFA 20 Closed Beta? Q: What is the FIFA 20 closed beta for? A: The main purpose is to test the game. It’s for players to try out a FIFA 20 game mode and give the developer feedback on anomalies they might find, and also suggest potential changes. This beta has also got the particularity of promoting the game itself. Q: How does the FIFA 20 closed beta interfere on the game’s development process? A: Just like the previous games, FIFA 20 is very complex joining several game modes together, for they’ve been developed over the years. There are several different teams responsible for developing determined projects and areas of the game that might or might not be integrated into the final product according to deadlines, the work’s quality and other economic and strategic factors. Which means that these teams are not always working for the next FIFA. The whole project must be exhaustively tested out for them to make sure it works correctly. For that, Electronic Arts usually invite a group of volunteers in their premises so they can test the game. After the adjustments regarding the first feedback period are made, the Alpha version is released. This is the version EA uses to show it to the public for the first time, at EA Play. The game’s official release occurs at the end of September and always comes along with an update that’s supposed to correct the anomalies detected after the disks are printed out. Between one thing and the other, there’s the beta and then there’s the demo. Q: In which languages is the FIFA 20 beta available? A: The in-game language for the Beta is English only. Q: Where goes the feedback? A: In a forum created for the purpose where the only people who have access to it are the invited players who registered. Q: Can I use the FIFA 20 Beta progress in the final game? Q: Is the Beta database updated? A: No. The players and ratings used in the FIFA 20 closed Beta are the same ones of the FIFA 19. Q: Will I be asked to do something other than give them feedback? A: Yes. For the developer the closed beta is like a big test, so they might ask you to test something out specifically. For example, in Ultimate Team you’ll receive credits so you can try buying packs. Q: How big is the file I have to download? A: Bigger than 34 Gb. When will be available the FIFA 20 Closed Beta? Q: When were the FIFA 19 closed beta invites sent? A: FIFA 19 beta invitations were sent from August 8, 2018 and were associated with your EA account (they cannot be shared). Q: When will the FIFA 20 closed beta invites be sent? A: FIFA 20 beta invitations will probably be sent on around August 7. Q: When does the FIFA 20 closed beta starts? A: Most likely on August 9, 2019 at 5pm UK time. Q: For how long does the FIFA 20 closed beta go on? A: Ten days. It ends around August 17 but it can be extended for two days. Q: What happens after this period? A: People can no longer have access to the FIFA 20 beta. At this point the players are supposed to give EA Sports feedback. Q: Is there a limit of players who can play the FIFA 20 Closed Beta? For which platforms will be available the FIFA 20 Closed Beta? Q: Which platforms will the FIFA 20 closed beta be available for? A: This test version is exclusive for Playstation 4 and XBox One. It won’t be available for PC, old-gen consoles or mobile platforms. Q: I already played a closed beta on my old-gen console. Are you sure it is not available this year? A: It’s true that the FIFA 16 closed Beta was available for Playstation 3 and XBox 360 but since then it is not anymore. Wich game modes will be available on the FIFA 20 Closed Beta? Q: Which game modes will be tested in the FIFA 20 closed beta? ✔️ Ultimate Team and Kick-Off. Q: When exactly are each of these game modes going to be tested? A: In the FIFA 20 closed beta all game modes will be tested at the same time, from the first to the last day. The difference is that the invitations will be addressed specifically to Kick-Off and one of the other three game modes. How to Get Invited to the FIFA 20 Beta? FIFA 20 Beta allows players to test the game before it’s release to the general public. The lucky users that get to test the game are required to offer feedback so that EA can tweak the game and fix any last minute bugs before the official release. However, not everyone will have the chance to be invited. We will explain to you how to improve your chances to play the FIFA 20 Beta Testing. ❎ You must have played FIFA 19 regularly. If you don’t know how to do it, just follow these simple steps. 5) Click ‘Update’ button on the bottom of the page. 2) Check if FIFA is available in the right side of the screen. If it is check its box. If it’s not, come back later to see if it was added. You don’t have better chances to play the FIFA 20 Beta if you live close from EA offices, played thousands of FIFA 19 matches or are a professional player. Game advisors cannot authorize and provide email invites if you did not receive one. As you see, the best you can do to improve your chances to play the FIFA 20 Beta is to follow our three simple tips. Be aware that updating your contact preferences, your game test program and the FIFA Insider status may not be enough to be invited to the Beta. Only players that are invited will be able to play the FIFA 20 Beta. They will start sending invitations in early August, gradually for each platform. Stay alert to your mailbox, the one you use for your FIFA account, to see if you were invited or not. Pay attention to all folders, including spam. The number of spots is limited. Eligible fans should be invited to the game mode they are most active within. The FIFA 20 Beta testing will include Ultimate Team, Pro Clubs and Career Mode. If you got invited, you are in the good way to play the FIFA 20 Beta Testing. All you need to do is to follow these four simple steps. 1 Use your existing Sony Entertainment Network account on PSN. 3 Select Redeem Codes at the bottom of the menu on the PlayStation Store. 4 Enter the code and get ready to play. 1 Go to Games under Store. 3 Sign in if prompted. 4 Select or enter the 25-character code and get ready to play. How to Play the FIFA 20 Beta? Q: If I get an invitation, for which game mode it will be? A: If you get selected then EA will most likely add you to the mode you played most. Q: Will EA unlock all the game modes? A: Yes, they usually do in the last two/three days. Q: How much does the beta cost? A: It’s free of charges. However, you’ll need a direct invite. You cannot buy it to anyone. Q: How can I play the FIFA 20 closed beta? A: Only players that are invited will be able to play the closed beta. Stay alert to your mail box, the one you use for your FIFA account, to see if you were invited or not. Pay attention to all folders, including spam. Q: Is the FIFA 20 beta available for players from every countries? A: No. Only select FIFA 19 players in North America (United States and Canada) and the UK who opted in to receive EA emails will receive an email at the address associated with their EA account. Q: When do they start sending the invitations? A: They will start sending invitations in early August. Q: I’ve received an invite for the beta in my e-mail. How do I know it’s legit? Q: I received an invitation. Does that mean I’ll play the beta? A: If you accept the invite, then you will. Q: What criteria do they follow while picking the players who earn invitations? A: Generally speaking, the selection process is random. Q: Do I have better chances to play the Beta if I live closer from EA offices? A: No. If you live in US, UK or Canada, the location has nothing to do with the selection. Q: Do I have better chances to play the Beta if I played a lot of FIFA 19? A: To be selected, you must have played a certain amount of games. However, it doesn’t need to be a lot of games. There are people who have played thousands of games and will not be invited. Q: Do I have better chances to play the Beta if I am good at FIFA? A: No. Your record has no influence. Q: Is there anything I can do to improve my chances to be selected to the FIFA 20 closed Beta? A: Yes. If you want to increase your eligibility for FIFA 20 Beta, check your Contact Preferences under Privacy Settings in My Account on origin.com and select the first box. You can also check if FIFA is available in the ‘Game Tester Program‘ tab. Another way to improve your chances is to become an EA Sports FIFA Insider. 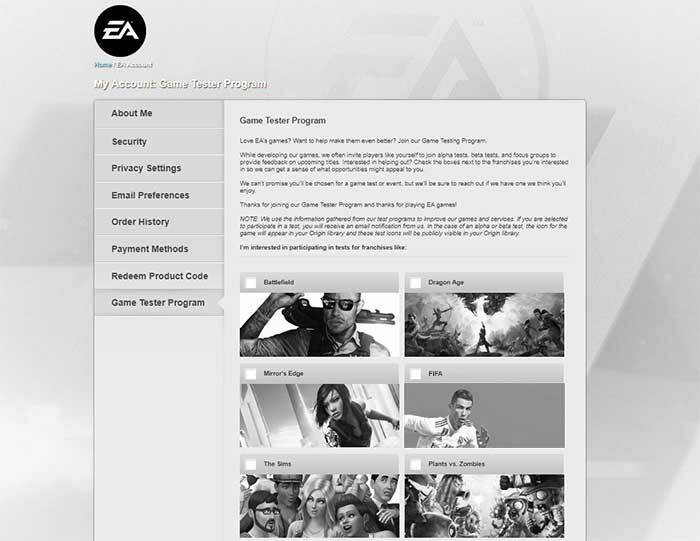 To do that, go to this page, login with your EA account and check the box ‘EA may email me about EA news, products, events and promotions’. Good luck! Q: Can I request an invitation to EA? A: No. Closed Beta has limited space. Not everyone will play it. If you haven’t received an invite to play, then you will not play. Game advisors cannot authorize and provide email invites if you did not receive one. They can’t do anything for you. Q: Can I sell or share my invite? Q: I’ve found invitations for sale. Are they legit? A: They’re almost never legit because invitations are always associated with one Origin account. Q: By accepting the invitation, what am I obliged to? A: You’ll need to fulfil the agreement of the closed beta, which includes a confidentiality term. Q: I’m a minor. Can I play the beta? A: No. It’s exclusive for players at the age of 18 or older. Q: What does the confidentiality term consist of? A: It basically forces the participants not to divulge any information regarding the game outside of the forum created for this purpose. Hence closed beta. Live streaming and image capturing of Closed Beta gameplay or forums is against the rules. Q: What happens to those who don’t fulfill the confidentiality term? A: They’ll lose access to this beta and to any other that’s released afterwards. Other measures can be taken for cases that are more serious. Q: Is it normal for the participants to break the rules of the term? A: Yes. EA Sports promote denunciation and inspect shared content, but as soon as the beta is released it’s guaranteed that some participants will make some information and images of the game public. If you’re one of the lucky ones that will get to try out FIFA 20 before everyone else, congratulations. Have fun testing the FIFA 20 closed beta and try making this game even better.